The room is almost pitch black as I step inside, and were it not for the frequent nudges from people behind me, it would be peaceful. A wash of electronics fills the silence with a foreboding ambience, and the mutterings of the crowd beneath it become a pleasant babble. In the corner, glowing so softly that it only becomes visible after I blink a few times, is a spinning sculpture of a molecule. As its light pulses in time to the sounds emitted from the room’s hidden speakers, an ephemeral scent evoking ancient forests and even more ancient gods drifts in—subtle, but with an underlying sense of power. The room, one of three arranged in a corridor and broken by “resting stations” containing abstract projections, is the beginning of Unsound Festivals’ Ephemera, a collaborative installation that utilizes sculpture, visuals and compositions from Kode9, Ben Frost and Tim Hecker. 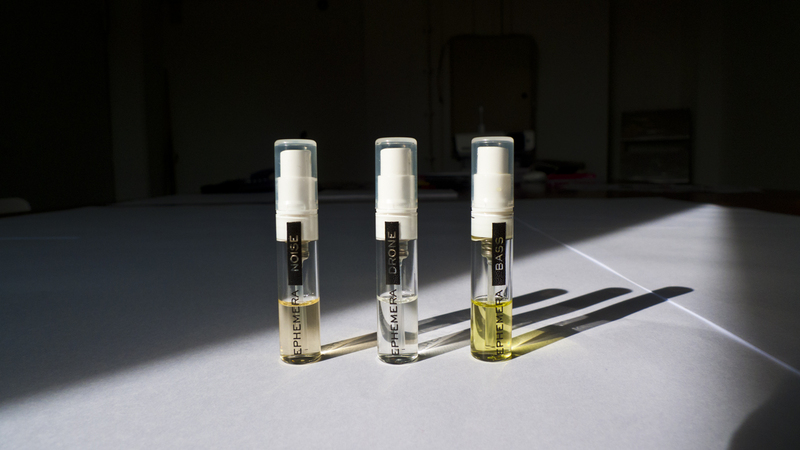 One of the main focuses, however, are individual scents crafted for the occasion by perfumer Geza Schoen, known for his 2006 pheromone-enhancing fragrance Escentric Molecules, which sought to provoke discussion on the way scents are marketed to the general public. While the installation’s highbrow conception says “art-piece,” it’s certainly the more wearable and easily marketable of the two lines Schoen has produced. But I say that as someone with junk pheromones that nobody really wants to smell. However, thanks to a decade of working in clubs, I’ve developed an olfactory organ primarily adapted to the smell of fog machine fluid and dirty concrete. And like other people, I find myself transported to another time or place instantly with the barest hint of certain smells, as they are obviously closely connected to memory and emotion. For that reason, smells are employed to manipulate mood. Tying that idea to music strengthens the connection; how many times has your mood shifted entirely because of a song? Ephemera picks up on the notion, but mutates it with elements of electronic music: BASS, NOISE and DRONE. With this in mind, I decided the best place to experience the scents in question was actually outside of the original installation, in a place where bass, noise and drone fester. In other words, a music venue. Borrowing the empty boiler room basement of Berlin’s Urban Spree along with a few decent speakers, I filled the small space with each scent and its corresponding sound. Steve Goodman’s piece recalls exactly what the title suggests: a burning vacuum cleaner smell. There’s a lot of base in BASS—it’s heavy, and while not necessarily something you want to dump all over your neck, wrists and junk (if you roll that way), splashed across the walls of a cold basement it had a surprisingly human touch. For me, it conjured up the detritus of an old study, untouched for weeks. But more than anything it summoned memories of my early teen youth spent in front of a computer. The dusty hum of an old PC and the slight alcoholic tang of keyboard cleaner hanging in the air are enhanced by mouse click samples and the compisition’s crackling dryness. In the acrid mustiness of BASS, the ghost of my adolescent browsing history whispers “aphrodisiac”. As dark and harsh as its namesake, NOISE hit my nasal passages like a blast of cold, metallic air. But what followed was closer in tone to warmth and candlelight. Signatures of well-worn dark wood and a heavy helping of frankincense and peppercorn were obvious, as was the sharp tang of ozone. The image that gradually formed in my mind, as I dance in the fragrant space to Frost’s majestic and sinister piece, was of some ancient place of worship—though, perhaps, not to any god of forgiveness and light. Easily my favorite of the trio, it clung to me long after the last notes of the music had faded. Like NOISE, Hecker’s contribution also conjures a pagan vibe, but the mood here is further from old gods and closer to the angelic or cosmic. “Immensity” is the word DRONE speaks inside the mind and nose, tied to this world by the odor of fir trees and juniper and the subtle earthiness of patchouli and ambergris. What DRONE finally leads up to, however, is something akin to antiseptic incense: interesting for the mind, but less so for my nose. At the end of this trial, I burnt a bit of sage to clear the air and disperse whatever nastiness was lurking around, because I had to go home and start writing. You don’t know real horror until you’ve stared at the hungry, expectant and empty face of a new .doc file for two hours on a deadline. After I packed up my gear, left the club and got the train, I noticed how strongly the scents still clung to me, like dying murmurs of attention. Unexpectedly, they combined in a way that made them all compliment each other. While NOISE will surely find the most use in my odor arsenal, the symbiotic bond of the three makes them ideal for combined re-perusal. In fact, I’ve taken to combining NOISE with WHISKEY and AMPHETAMINES, and eventually MINOR HEAD TRAUMA. I call it HNW. The accompanying compositions are generally unlistenable. This article originally appeared in the Spring 2015 issue of Electronic Beats Magazine with art direction by Johannes Beck. To read more from this issue, click here and read our review of Unsound 2014 here.